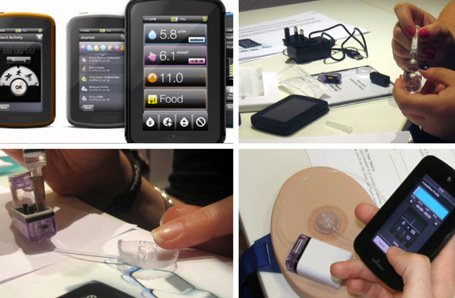 Over the last couple of years I’ve been lucky enough to be involved in the R&D programme for a ground-breaking medical device to help diabetics manage their insulin treatment. Part of the project was to reach a regulatory milestone, which has now been achieved. To reach this milestone we tested the usability of the device to prove it was intuitive and the design prevented people from giving themselves a mis-dose or even fatal dose of insulin. …and the big one… people’s health and lifestyle literally in their hands and plugged into their bellies. Aside from having my eyes opened to the world of diabetes and being humbled by the courage of the people I met during the research, …it’s been so satisfying to see design research deliver such a tangible impact. I worked in conjunction with London User Research Centre and with Design Science in Philadelphia. This entry was posted in Design research, Empathy, Favourite projects, Uncategorized, User Centered Design, User research by Nick. Where can we read more? Hi Simon. Yes, fascinating work, the type you’d also enjoy. The product is called Cellnovo, you can check their website but they don’t talk about the development process. Did you have anything to do with the FDA? FDA was on the horizon but we were supporting efforts towards a European regulatory approval called the CE mark. As you probably know there are many more hoops to jump through in the medical world, like clinical trials which is the final, critical milestone for a product like this. The high stakes along with the potentially life changing outcomes do make things exciting. I’ll jump at the chance for another medical sector project!